PrintOnCarpet.com announces its launch, designed to fill the demand for custom made, high quality, large scale carpeting and flooring. Customers can choose from four different grades of carpet, select from vinyl flooring options including white and clear and decide on the size, up to a large 10 feet wide by any length, with wider stitched together options available. For the artwork, PrintOnCarpet.com invites potential buyers to browse from their extensive image library of more than 1000 FREE images. Customers may choose to use their own artwork such as logos, product images and illustrations to truly create a unique carpet or flooring experience. Upon request, PrintonCarpet.com does provide design services and support. In order to offer the highest quality of products, PrintOnCarpet.com utilizes the latest technology and their years of expertise in dye-sublimation printing. During the printing process, colors are actually transferred into the fibers of the carpet using extreme heat and pressure, which means the carpets display full color imagery in striking detail. All products can be machine washed and can withstand heavy foot-traffic areas. 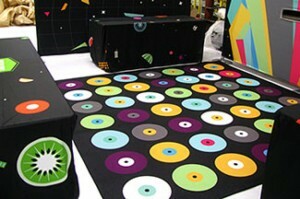 Beyond carpeting, PrintOnCarpet.com specializes in customized high quality flooring with options like: Marley Rubberized found in dance floors, printed tiles, and adhesive floor graphics. PrintOnCarpet.com caters to an expansive list of large industries including: Advertising and Marketing, Colleges and Universities, Corporations, Events, Entertainment, Fashion, Food, Beverage and Healthcare to name a few. Each week the site highlights new client samples and shows off featured projects for big name companies nationwide. PrintOnCarpet.com is a division of Enhance a Colour (eacgs.com), a full service custom graphics and display company based in Danbury, Connecticut. Their headquarters accommodates complete on-site production and manufacturing capabilities. Projects are managed from start to finish, including concepts, prototypes, reproductions, graphic fabrication, fulfillment, and installation. Products produced include: banners and signage, carpets and flooring, indoor and outdoor displays, theater backdrops, curtains, props, wall coverings, vehicle graphics, trade show and mobile event environments.